Content marketing is critical for all businesses, and perhaps even more so for small businesses, because small businesses need even more exposure than do large corporations, especially when you’re trying to level the playing field with the big companies. Your Internet presence is vital for conveying the core values of your brand, and for positioning you as an authority in your field, and by establishing a regular blog, you can make sure your voice is heard by your audience. There are literally tons of things you can blog about, and to get you started, here are 51 ideas that you can try, to start connecting with your target audience. Discuss plans for the future. Provide your readers with a sneak peek of what you’ll be doing in the coming year, so you can start generating buzz. Talk about industry trends. When you discuss how things are changing in your industry, you become an authoritative voice. Pose a question to readers. Ask a question of your readers which you’d like to know the answer to, and let them create the content. Oppose a popular opinion. When you oppose a popular opinion, it stirs up controversy and engages your readers. Write up a customer testimonial. When you receive a really good customer testimonial, request permission to create a blog from it, and use that blog to encourage more testimonials. Assemble a roundup of opinions. When you find a number of interesting opinions on a particular topic, round them up into a single post which treats the best ones. Use a familiar person or subject. Mention a local folk-hero or celebrity in your post, because readers will be able to identify with it. Discuss local news. If there are current events which are affecting your customers, this can be a great topic for discussion. Answer popular questions currently being asked. A post which simply treats popular FAQ’s will show that you’re responsive and considerate of customers’ interests. Refer to an existing popular post. If there’s a popular blogger who has created an interesting piece of content in your niche, add in your own viewpoint, and include a link to the original post. Review a book. If you’ve recently read a good book which you think might appeal to your customers, write it up. Create an infographic. Infographics are filled with facts and have interesting graphics to keep readers engaged. Run a comparison test. Compare two or more products which are related, to help users decide which is better for them. Prepare a podcast. Record a session where you provide users with useful tips, or conduct an interview with an industry expert. Report on conference activities. Relate the events and speakers’ talks from a conference you’ve attended to your readers. Review a servcie or product. This review can either be about one of your own products or a competitor’s, which will be of value to your readers. Explain your special process. Explain to your readers what your unique process is, and why it adds more value to the products they shold be buying from you. Post a product video. Take a break from blogging, and offer some variety to your readers with a video posting. This can be about a new product you’re launching, or about upcoming events in your company. Introduce company employees. Put a human face on your company, by introducing critical personnel to your readers. Make a prediction. Everybody is fascinated about what might happen around the corner, so give readers your opinion. Run a contest. Offer a worthwhile prize to the reader who produces the most interesting use of your product, or has the best suggestion. Relate your past blunders. Most people enjoy reading about business mistakes made by people they know, and what was done to overcome those mistakes. Conduct a reader poll. Set up a poll on your website or business Facebook page, which invites readers opinions on an important topic. Create an ongoing feature. One good idea would be to run a ‘customer of the week’ or ‘customer of the month’ feature, which will keep your readers engaged, since it just might be one of them. Talk about your heroes. Write a post about some of the thought leaders who inspire you, or whose work you admire. Start a debate. Invite your readers to submit disagreeing perspectives on some issue that you’ve recently blogged about. Conduct a user opinion poll. Find out what you should name a new product, or what kind of product your readers would most like to see, by conducting a user opinion poll. Write a blog series. Writing a connected series of blogs is a great way to keep readers coming back, especially if you can write about a topic that needs to be broken down into several parts, and has significant interest to your followers. Call attention to your charity work. Post a blog about your involvement in the community, or about contributions you make to the community. Run keyword posts. Consult Google Analytics to find out which keyword searches are used by customers coming to your website, and tehn write posts about these keywords. Read posts written by your competitors. When your creative well runs dry, check out posts written by your business rivals to see what kind of content is drawing interest. Tell your business story. Everyone enjoys reading about a success story, and the challenges which had to be overcome to reach that level of success, so relate all this to your readers. Share customer feedback. After you’ve gathered a significant amount of customer feedback from surveys and comment cards, write up some of the best customer comments in a post. Show off your sense of humor. Relate some of the funniest incidents which have occurred in your workplace – people really enjoy reading material from someone who can laugh at themselves when things go wrong. Tell readers about your passion. Whatever it is about your business that gets you really passionate, this is something you should relate to your followers, because they will love the personal aspect of the stories. Reveal industry secrets. If you have some insider information about your industry, your followers would probably love to hear about it. Create a business award. Everyone loves reading about award winners, especially if the award is for some service or achievement that interests them. Post about the finalists, and describe the winner and why he/she won the award. Share business highlights. What are some of the most important moments in the history of your business, and why were those moments so important? Relate to your readers how these moments helped establish or change your business. Write a post about your poll. If you’ve recently conducted a poll among your followers, write up a post which describes the results. Inspire your readers. Write about something in your business life or your personal life that inspired you, because many of your followers may also find it inspiring. Celebrity Q&A. Your readers will love to read the answers given to your questions which are put to a local celebrity or hero. Product ideas. This is a post you could write which describes how some of your products came about, and you can give credit to those people involved in development and production. Provide something special. Make a post announcement about a party or a special giveaway which features a new product or which simply rewards your followers for continuing to read. How-to blog. If you have products which can be used in more than one way, why not blog about some alternative ways of using these products? Share your unique vision. If you have a philosophy which is vastly different from many of your competitors, you should relate to your followers how that perspective is different. A day in the life. Provide your readers with a full description of a day in the business life at your workplace, because many of them will be able to relate to those small tasks which make up a full day. Tips and tricks. This is a great alternative to posting a full how-to kind of description of how to use your products – just give your readers a few tips and tricks on usage. Write a ‘Best of’ blog. Dredge up some of your most popular posts, and re-post them so that newer readers have the chance to read some of your best work. Kudos to vendors. Write a post about some of your vendors and suppliers, and what makes them so good to work with, and then invite them to return the favor in their blog postings. Lessons learned. Write a post about some of the most important lessons you’ve learned while in business, and how those lessons may relate to your personal life. Depending on the kind of message you’d really like to convey to your readers and visitors to your website, you can adapt many of the ideas above to suit your purposes. 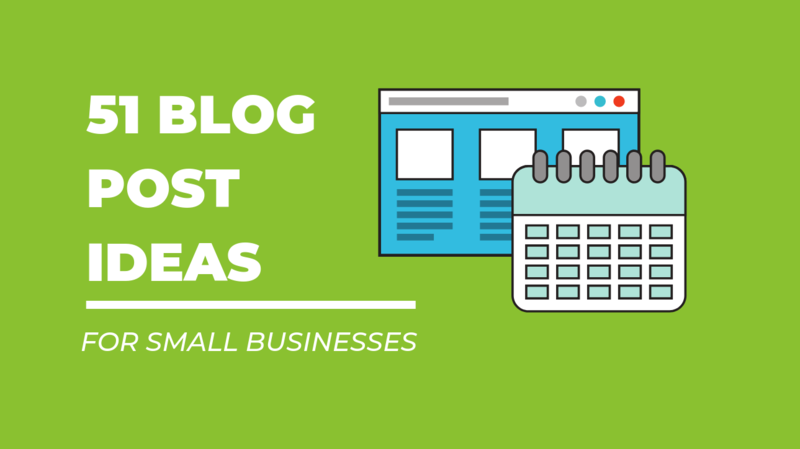 Once you’ve gotten started, and have begun making a real connection with your followers, you will undoubtedly come up with hundreds more ideas for things to blog about. The main takeaway from all this is that you should regularly connect with your followers, so they come to recognize your company as an active and involved business entity, rather than one which is cold and without a human face behind it. Happy Blogging!